Barnes and Noble is entering new territory with its Nook tablet by adding native maps through skobbler. By partnering with the Germany-based company, Barnes and Noble is bringing skobbler's ForeverMap 2 app to the Nook app marketplace. The app will be a free download for the basic version, with a paid version offering downloadable maps for offline access also available for $4.99. 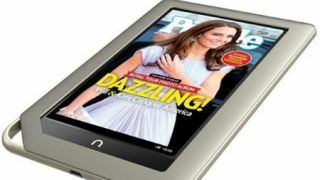 Barnes and Noble has said it will also open up the Nook platform to further location-based app developers later this year. Up until now, the Nook Color and Nook tablet relied on Google's web maps for navigation. This is in large part because Nook devices do not have built-in GPS capabilities. The ForeverMap 2 app will be dependent on Wi-Fi to access map data, hence the paid version to download maps for offline use. Barnes and Noble director of developer relations Claudia Romanini said that the skobbler partnership "signals a brand new opportunity for Nook app developers to create location-aware apps, products and services that help our millions of Nook Tablet and Nook Color customers experience and navigate their physical surroundings in unique and innovative ways." Perhaps it also signals a GPS infused future for the next round of Nook devices, because public Wi-Fi access still isn't up to the task in most areas.